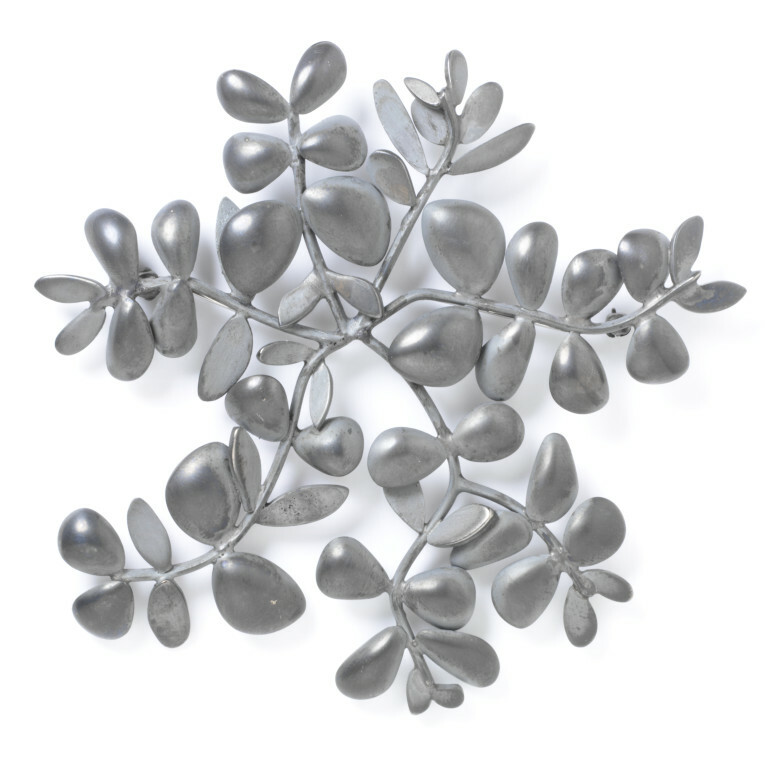 'American Sidewalk Brooch' is based on the Purslane plant with its dense network of stems and leaves, and it is part of the 'City Flora / City Flotsam' collection by American jeweller Jan Yager, exhibited at the V&A in 2001. In this group of work Jan Yager concentrated on the harsh urban environment around her studio in Philadelphia. Focussing on the pavements, or 'sidewalks', the Flora element explored the determined survival of hardy city plants while the Flotsam gave a darker picture of the endemic use of drugs and guns. Although many elements are distinctively American - chicory flowers and purslane are not familiar sights on British city streets - there is a universality to the problems, the glimmers of beauty and the sadness that her work evokes, and it comments sensitively on inner-city life today. 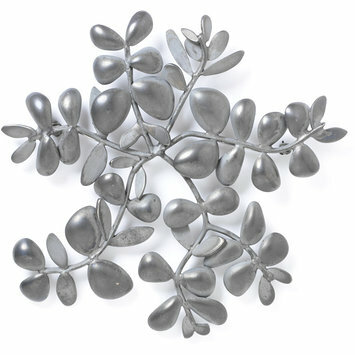 Brooch of dark grey silver, with six leaf-covered branches curving out asymmetically from the centre. According to the artist it is made up of 67 elements, with 103 solder joints. 'I wanted this work to be rooted in history, yet undeniably of its place and time. After a wide search for inspiration, I narrowed my focus to the sidewalks outside my studio. For years I had turned a blind eye on these immediate surroundings. In an attempt to take a closer look, one day I decided to 'beachcomb' the area. I returned with broken bits of auto glass, paperclips, cigarette butts, a few spent bullet casings, and lots of colorful crack vials. City Flotsam - frighteningly tangible evidence of drugs, violence, and crime literally at my doorstep. It spoke of such immense tragedy to me, and it became the point of departure for this series. Thankfully, this search also yielded the antidote. Nature's resilient beauty was also at my feet. City Flora - the often overlooked, much trampled upon, and increasingly non-native species growing insistently in vacant lots and from the cracks of sidewalks. I began to study the radiating geometry of dandelions, the penetrating delicacy of chicory blossoms, and the microscopic structures of seeding purslane. I marveled at nature's adaptive inventions and discovered that growth and decay are inseparably interwoven. City Flotsam and City Flora present sharp contrasts - but reality is they are two sides of the same coin. Both are evidence of a long history of circuitous routes of trade. In 1682, Londoner William Penn secured use of the land around my studio - now called Philadelphia - from the Lenni Lenape. Three centuries hence, the descendants of these North American Indians, European colonists, African slaves and willing immigrants from around the world, continue to put down roots and lay claim to this land. 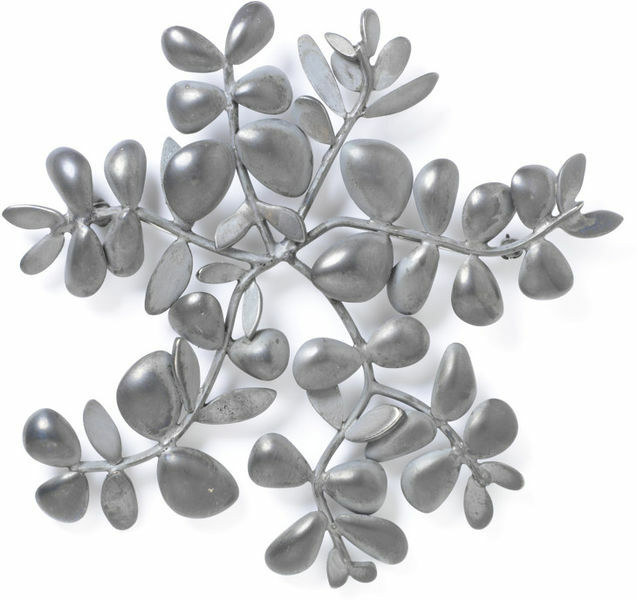 Brooch respresenting the purslane plant by Jan Yager, United States, 1999. Rosolowski, Tacey. Intervening in Amnesia: Jan Yager's Mnemonic Adornment. Metalsmith. 21.1 Winter 2001.